At just 16 years old, Climate Reality Leader Jamie Margolin is one of the 13 plaintiffs suing Washington State for failing to take adequate steps to fight climate change. And on July 21, she’ll be at the helm of a mass youth climate march in Washington, DC, led by her organization, Zero Hour. Jamie, who hails from Seattle, WA, says her upbringing was what led her to take interest in environmental issues, which she believes are inevitably intertwined with social justice. Back in 2016, she gained hands-on experience organizing voters while volunteering on Hillary Clinton’s campaign. Following the election, Jamie became a community organizer at Plant for the Planet, a youth organization that seeks to fight the climate crisis by planting trees across the world. Since her involvement with Plant for the Planet began, Jamie has traveled several times to the state capitol in Olympia to lobby for common sense legislation to curb climate change. Then, in the summer of 2017, Jamie was accepted to attend the Climate Reality Leadership Corps Training in Seattle, which she says pushed her to further her environmental activism. From there, she says she began to think seriously about organizing a youth climate march, which then evolved into her organization, Zero Hour. The goal of the march, Jamie says, is to instill a sense of urgency and call attention to communities disproportionately affected by the climate crisis. In addition to the march, there will also be a lobby day, taking place on July 19, in which young people will call on their elected officials to divest from fossil fuels. As a high schooler herself, Jamie believes it’s especially important for young people to be involved in climate activism, and is determined to build a movement that represents those on the frontlines. But Zero Hour won’t end with the march, or even the lobby day. Jamie says her organization will continue to fight for those on the front lines of the climate crisis. We’re so inspired by Climate Reality Leaders like Jamie. Join the youth-led call for climate action! 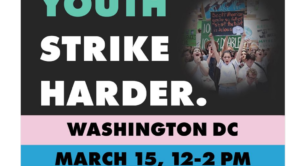 You can get involved with Zero Hour – by taking to the streets at the Youth Climate March on July 21 and by participating in the lobby day on July 19. To learn more, visit the Zero Hour website. And if you’re inspired by Jamie, remember that you can become a Climate Reality Leader, too! In August, we’re headed to Los Angeles to welcome the newest class of climate champions like Jamie. It’s going to be the largest training ever – and you don’t want to miss it! Join us and gain the skills, knowledge, and network to shape public opinion, influence policy, and inspire your community to act at this critical time. Apply today!